Not only is the first law wrong but just about every word in the first law is wrong. When we examine Newton’s first law, or just look at the pictures in a child’s astronomy book we observe that nothing in the universe is in a state of rest – everything is moving. Everything is in orbit about something else and so nothing moves in a straight line. Additionally, every body in the universe is affected gravitationally by every other body in the universe. One would need to be outside of the universe to test Newtons law; therefore it is impossible to check the validity of the law. It begins to become apparent why it was so difficult to land the first probes on the Moon using 300 years-old science. Readers are encouraged to check these facts for themselves. Few people visit the Royal Institution, in London’s Albemarle Street, for amusement. There are not many laughs at Britain’s second oldest scientific institution, founded in 1799, where Sir Humphry Davy demonstrated his discovery of the elements sodium and potassium and where Michael Faraday discovered electromagnetic induction. It’s true there have been some lighter moments in the famous circular lecture theatre, especially since Sir William Bragg introduced Christmas Lectures for Children in the 1920s. But, on the whole, this is stuffed shirt territory. One night in 1973 the stuffed shirts got a shock from which they have still not recovered. It was an experience at which, like Queen Victoria, they were not amused. Indeed it was so unamusing for them that it is the only occasion in the Royal Institution’s two hundred year history that it has failed to publish the proceedings of a major lecture, or ‘evening discourse’. 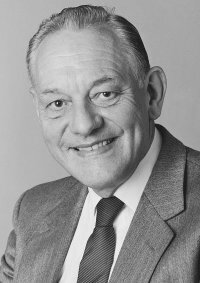 The cause of this unique case of scientific censorship was the maverick professor of electrical engineering of Imperial College, London, Eric Laithwaite. Wiki: All that remains of the Tracked Hovercraft test system, the RTV 31 test vehicle and a single portion of its guideway preserved at Railworld near Peterborough. One of the lifting pads can be seen at the extreme rear, just under the tow bar. One of the centring pads can be seen at the rear of the vertical skirt. The advantages of such a tracked hovercraft are obvious to anyone who sees a hover-rail train running along,suspended in the air above the track — it is quiet, has no moving parts to wear out and is practically maintenance-free. The significance of this last point quickly becomes clear when you learn that more than 80 per cent of the annual running costs of any railway system is spent on maintenance of track and rolling stock because of daily wear. The British government at first invested in the development of his device but later, after a series of budget cuts, pulled out pleading the need for economy. Laithwaite, a blunt-speaking Lancashire man who did not shrink from speaking unpopular truths, told the Government and its scientific bureaucrats the mistake they were making in no uncertain terms, but its decision to cancel was unchanged. Laithwaite refused to be beaten and took his invention one step further. He designed an even better kind of hover train — one in which his linear motor was levitated by electromagnetism giving a rapid transit system that not only provides quiet, efficient magnetic suspension over a maintenance-free track, but which generates the electricity to power the magnetic lift of the track from the movement of the train. Laithwaite’s Maglev design was not quite perpetual motion, but certainly sounded enough like something-for-nothing to make the scientific establishment turn its nose up in suspicion. But this project, too, was cancelled by the government and further development was halted. Today, Maglev trains are being built in Germany and Japan but Britain continues to spend 80 per cent of its railway budget on maintenance of conventional transport systems — several hundred millions every year. With the Maglev project cancelled, the technology Laithwaite had devoted the previous twenty years to developing was put in mothballs. The object of his entire career for decades disappeared overnight. By an extraordinary chance at just the same time that the Maglev project was cancelled, Laithwaite received an intriguing telephone call out of the blue from an amateur inventor, Alex Jones. When Jones arrived in the laboratory he had a strange-looking contraption to show. It was a simple wooden frame on wheels that could be pushed backwards and forwards on the bench top, like a child’s trolley. But suspended from the front of the frame was a heavy metal object that could swing from side to side like a pendulum. The metal object, Jones explained, was a gyroscope. As Laithwaite looked on in puzzled amazement, Jones started the gyroscope spinning and then allowed it to swing from side to side. The wooden box moved along the bench top on its wheels although there was no drive to the wheels and no external thrust of any kind — something that shouldn’t happen according to the laws of physics. In retrospect it might seem to be rather risky for Sir George to have invited a blunt-speaking and controversial figure to address the Institution. But, until then, Laithwaite’s clashes with the government and scientific bureaucrats over the development of his Maglev train had been a conflict over money and over innovation: not over scientific principles. He had fought the same kind of battle as most senior scientists in Britain for scarce resources. He may have been the sort of outspoken individualist who finds himself in the headlines, but he was still a distinguished professional scientist, still a member of the club. It was against this background that the Royal Institution invited him to deliver the lecture. But the Friday Evening Discourse is no ordinary lecture. It is a black tie affair, preceded by dinner amidst the polished silver and mahogany of the Institution’s elegant Georgian dining room, under the intimidating gaze of portraits of the giants of science from the eighteenth and nineteenth century, staring down from the panelled walls. When you are invited to be thus feted by your fellow members of the Royal Institution and to deliver a Discourse from the spot where Faraday and Davy stood, it is usually the prelude to collecting the rewards of a lifetime of distinguished public service: Fellowship of the Royal Society; Gold Medals; perhaps even a Knighthood. In keeping with such a conservative occasion, those invited to speak generally choose some worthy topic on which to discourse — the future of science, perhaps, or the glorious achievements of the past. But Laithwaite chose not to discourse on some worthy, painless topic but instead to demonstrate to the assembled bigwigs that Newton’s laws of motion — the very cornerstone of physics and the primary article of faith of all the distinguished names gathered in that room — were in doubt. Standing in the circular well of the Institution’s lecture theatre, Laithwaite showed his audience a large gyroscope he had constructed — an apparatus resembling a motorcycle wheel on the end of a three foot pole (which, is precisely what it was). The wheel could be spun up to high speed on a low-friction bearing driven by a small but powerful electrical motor. Laithwaite first demonstrated that the apparatus was very heavy — in fact it weighed more than 50 pounds. It took all his strength and both hands to raise the pole with its wheel much above waist level. When he started to rotate the wheel at high speed, however, the apparatus suddenly became so light that he could raise it easily over his head with just one hand and with no obvious sign of effort. The resounding silence of his audience continued long after that fateful evening. There was to be no Fellowship of the Royal Society, no gold medal, no ‘Arise, Sir Eric’. And, for the first time in two hundred years, there was to be no published ‘proceedings’ recording Laithwaite’s astonishing lecture. In an unprecedented act of academic Stalinism, the Royal Institution simply banished the memory of Professor Laithwaite, his gyroscopes that became lighter, his lecture, even his existence. Newton’s Laws were restored to their sacrosanct position on the altar of science. Laithwaite was a non-person, and all was right with the world once more. Laithwaite’s reactionless drive is an extraordinary machine; a machine that orthodox science said could never be built and would never work. But though it may well eventually prove of great value — perhaps even providing an anti-gravity lifting device — it is a net consumer of energy, just like Griggs’s Hydrosonic pump. There is no evidence at present that it is an over-unity device — merely a novel means of propulsion that proves there are more things in heaven and earth than are currently dreamed of by scientific rationalism. I read your E-Mail message dated December 2 inviting news having bearing on antigravity. Hence this message which I am copying to Hal Fox and James Cox. I have seen in this morning’s U.K. newspaper: THE TIMES (Thursday, December 4, 1997, page 25) the obituary of Professor Eric Laithwaite, who died on November 27, aged 76. Having followed his research with interest and visited him a while ago to discuss his findings and witness his demonstration of the loss of weight of a 50 lb. flywheel that he lifted effortlessly I thought I should draw your attention to some comments that were included in his obituary. The obituary goes on to explain then how Laithwaite’s efforts to show the weight loss of the gyroscopic devices he built were met with ‘utter hostility’. He retired from Imperial College in 1981 pretty much in disgrace. But he never lost his fascination for gyroscopes. “None of my critics could ever explain to me how a 50 lb spinning wheel loses weight,” he said. He teamed up with Bill Dawson, a fellow electrical engineer and businessman and spent the last years of his life experimenting with a variety of complex gyroscopic rigs, finally proving to his satisfaction that they could produce “mass transfer” – a brand of new thrustless propulsion system. In 1993 he applied for a patent on a gyroscopic space-drive. In September 1996, however, two NASA scientists arrived at his Sussex University laboratory, and his life went full circle. They were looking for a new way of getting spacecraft into earth orbit, and headed straight for the world expert. “I showed them all the magic of magnetic levitation,” said Laithwaite happily, “and they gave me a contract.” He was working on Maglifter when he collapsed. The obituary published in THE TIMES is quite lengthy. Its opening paragraph adds a little more detail to the latter project: At the age of 76, at a time when many emeritus professors have long since hung up their gowns, Eric Laithwaite was happily working, like a schoolboy with a Meccano set, on the biggest project of his life – a huge working model of a futuristic rocket launcher. America’s National Aeronautics and Space Administration had commissioned him to develop a concept worthy of Ian Fleming’s Dr. No – a five-mile long track to be tunneled up the inside of a 10,000 ft. mountain, hurtling a space capsule through the summit into Earth orbit. The power was not to come from conventional rockets but from the love of Laithwaite’s lift- linear motors. Readers of this message who are interested in anomalous levitation phenomena will feel added sadness to hear that this great pioneer, Eric Laithwaite, has passed away. No doubt NASA will pursue that project regardless of this loss. For my part as a remote observer, I am reminded of my own brief meetings with Alex Jones and with Eric Laithwaite and am more than curious about that comment about “mass transfer”. I recall that Laithwaite told me of research funding received from Prince Charles and used to build a machine involving gyroscopic devices set in two adjacent compartments. These were to be screened from one another in a physical sense, but arranged to allow the transfer through the physical screen of something associated with the spin of one gyroscopic device that could be detected by its effect on the other device. Here, my mind was on the possibility of the aether developing its own spin and being shed as a kind of ‘thunderball’ which could be moved through the wall separating those two compartments. If that machine, when eventually built and tested, did in fact exhibit such a phenomenon, then one can but be curious and wish to know more. As to that loss of weight by the 50 lb flywheel I also recall the time when Professor Salter of Edinburgh University, an expert of gyroscopes, was offered funding by British Aerospace to stage demonstrations testing devices that purport to lose weight, but the event, though planned, was cancelled. Laithwaite, I heard, had refused to go to Scotland to prove something that could be demonstrated so easily in his own university base in the South of England. All one needed to see was Laithwaite standing on a large weighing machine and doing his flywheel lift while one read the weight recorded. It was only years later that a television documentary on Laithwaite’s gyroscopic activity, which included participation by the Alex Jones, was screened here in U.K. and it did include that weighing machine demonstration which proved the weight loss. Such interest as I have in these matters is merged with my own pursuits that I am recording on my own Web pages on Internet at http://www.energyscience.co.uk and so I regret that I cannot add more to this note about Professor Laithwaite. Perhaps others will already have notified you of his death, but being here in U.K. it seemed appropriate for me to send you this message. experiments shown in this half hour video. It was harder than I thought it would be, but over the last few weeks, success! entire system moves outward about two feet away from the plumb line! the next 180 degrees, it strokes in the reverse direction . McCabe, Richard Foster, and many others. This file is from the Sunday, November 10, 1974, Indianopolis Star. A British scientist said yesterday he is on the threshold of inventing an antigravity motor that could fly a manned spaceship to the stars using nuclear fuel the size of a pea. Eric Laithwaite, professor of heavy electrical engineering at London’s Imperial College of Science and Technology, said the motor is based on the gyroscope, a rapidly spinning top that defies gravity. Gyroscopes already are used to guide spaceships. “The motor is not easy to explain. If it was, others would have tried to produce one by now,” said Laithwaite, who described himself as an astro engineer. Laithwaite began working on the motor about six months ago after to him with the idea. Rickman had patented it after he said it came to him in recurring dreams. Laithwaite incorporated in the device ideas of another amateur inventor, Alex Jones. Although Laithwaite is far from the production stage with his motorto defy gravity, the 53-year old professor demonstrated his principle Friday at the Royal Institution at London. Inside a box he brought before his distinguished audience were two electrically driven gyroscopes, each placed on a central pivot. Laithwaite made the gyroscopes rotate at high speed, and they roseinto the air on the arms until they reached a curved rail that pushed them down again. The process then repeated itself. With the two gyroscopes motionless, the box weighed 20 pounds on an ordinary kitchen scale. With the gyroscopes spinning, the contraption weighed 15 pounds. Laithwaite said the loss of weight corresponded to the gravity loss produced by the spinning gyroscopes. Theoretically, the machine could produce weightlessness, Laithwaite said. A spaceship with his device could be blasted from the earth’s gravitational field with conventional rocket fuel, Laithewaite said. Then, without friction to hamper the anti-gravity engine, nuclear power or solar energy could begin operating the gyroscopes and to drive the vehicle to other solar systems, he said. Laithwaite said the antigravity motor is based on electromagnetism and vector multiplication “too complicated to explain.” Then he tried: “Let me put it this way: You take a go-kart with no engine and sit in it. It is loaded with a box of lead balls. If you throw one ball out behind you, you move forward a little. Throw another and you move farther still and so on.